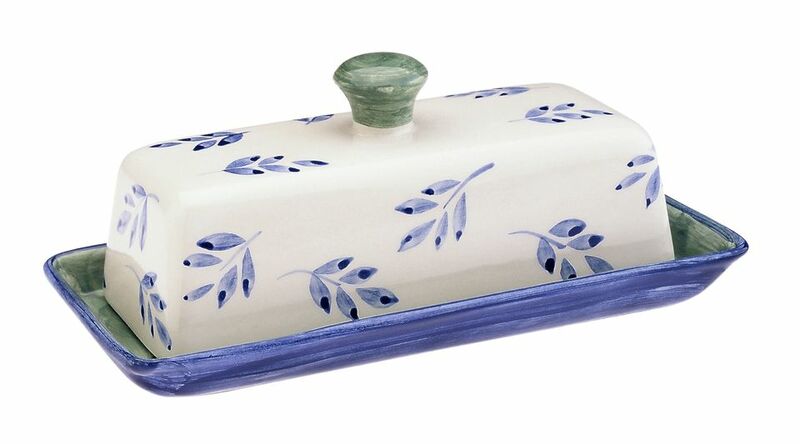 Ceramic is the ideal material for a butter dish, as it’ll keep your butter perfectly cool in the kitchen. If you build your butter dish out of a clay such a stoneware, it should also be able to retain its cooler temperatures for longer (just look to the likes of the famous brand Le Creuset for inspiration). Keeping your butter in a butter dish out on the kitchen top, instead of in the refrigerator, means it’ll be much easier to spread. Another great thing about making your own butter dish (and one in which your gift recipient will love) is that you can play with the sizes, clays, and weights and create whatever glaze or pattern you like. There are two ways of throwing a ceramic butter dish, the first is on the wheel and depending on your level as a ceramicist, a wheel-thrown dish can be a little tricky at first to master, but the results can be beautiful. Butter sticks can vary in size, so to make sure you’re throwing a butter dish that will fit your butter stick then first get out your calipers and measure it, so you can cut your clay the right size. Many potters recommend using around a pound of clay per butter dish. Once you’ve centered your clay you’ll need to open it out and widen it to the size of the measurement you have taken on your calipers. Use the two-ring method (one for the walls of the butter dish and one for the lid). It’s recommended you pull the inside wall up first to your desired height, trimming off the top part neatly (make sure it’s as smooth as possible). Then you can work on pulling up the outside ring. This only needs to be around half the height of the outside walls. Mark your four corners to shape the clay from on the outside walls and leave to dry a little. Once the clay has lost some of its moisture you can form it with your hands to the shape you desire. An oblong with rounded edges is always a great bet. Then you just need to roll a bottom piece for both the lid and the walls. It’s great to use a slab roller if you have one. Then you can attach the bottom pieces to the walls and the lid, scoring lines neatly into the clay and adding a little slip. Add handles if you want on the edges and a neat little handle on the very top of the lid. From this point you can leave your butter dish to dry to leather hard then it’s ready for bisque ​and glazing. An easier way to make a lovely butter dish is actually to do it by hand. Roll out your clay as thick as you need. Again, now is a great time to use a slab roller. Once you’ve rolled the clay make sure it’s as smooth as possible. Now you'll need your template (basically a paper or card cut out template will work great). You can find some great templates on Pinterest complete with their sizes; they look a little like a cross shape with sloped edges. Lay your template on your freshly rolled clay and neatly cut out your shapes. You’ll need templates for both the top (lid) and bottom pieces. Once they’re cut out leave them to dry a little, but not to leather hard. Make sure you make indents in the bottom dish so the lid can sit neatly on it, then curve your lid neatly, smoothing the edges, folding them over and scoring then attaching them neatly with slip. Your two pieces are then totally ready to dry out and move on the bisque and glazing stage. You create any type of handle you like for the lid.